The Rolling Meadows boys cross country team qualified for the state competition for the first time in the school’s 48-year history. Photos provided by the Rolling Meadows boys cross country team. 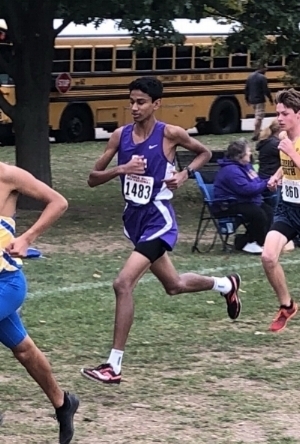 Last October, after the Rolling Meadows High School boys cross country team placed 15th out of 18 teams at sectionals, the runners called a meeting. At the time, most of the athletes were juniors who had long desired to qualify for the state competition. But only the top five teams in the sectional competition could advance. Together, at that meeting, the boys decided to make some major changes. They increased the length of their runs, trained more consistently and incorporated exercises such as swimming and bicycling into their workouts. Outside of running, they ate healthier and focused on getting more sleep. The student-athletes said their motivation pushed them forward and helped them to work more cohesively as a team. Under the coaching of Frank Schweda and Joel Dufkis, the Rolling Meadows boys cross country team this year qualified for the state competition – a first in the school’s 48-year history. Below are the students’ stories of grit, leadership and perseverance. At the state meet, Barretto was the second-fastest Mustang, ending with a time of 15 minutes and 12 seconds. His teammates have high hopes for him in the years to come and believe he could be one of the fastest runners in Rolling Meadows history. But for now, the 15-year-old is focused on building upon the team’s recent success. He believes the school will have a solid group of runners next year, and wants the group to continue training consistently and responsibly. He is grateful for everything the upperclassmen have done. When Aidan Fruzyna was a freshman on the cross country team, he saw his teammates work hard and excel. Their ethic and success inspired him to be better. Three years later, Aidan was inspired once again by his teammates after they challenged themselves to qualify for the state meet. Aidan realized he needed to work harder – not for himself but for his team. Following in the footsteps of his older brother, Aidan began running in middle school. After joining the cross country team at Rolling Meadows, he ran with the faster runners to improve. The 17-year-old says being a member of the cross country team has helped him in several ways, especially with time management. He juggles AP and honors classes and WildStang, the district’s robotics team, with running cross country and track. One of Jacob Johnson-Wright’s motivations for running is his older brother. The other motivation is the sense of satisfaction he feels knowing he ran well to help his team. Growing up, Jacob’s brother, Brendan Thielsen, ran and later joined the cross country and track teams at Rolling Meadows. Jacob followed in his footsteps and has always wanted to break his older brother’s track record. Jacob says he felt this was the year for Rolling Meadows because each member of the cross country team was motivated. As a team and as individuals, they all knew what they were running for and were committed to making changes and following through. The team at a state send-off at Rolling Meadows High School. Eddie Lennon will tell you that he was “OK” when he started running cross country several years ago at South Middle School. Today, he’s the 11th fastest runner in the state. The 17-year-old joined the Rolling Meadows boys cross country team as a freshman. At the time, he estimates he was the fourth or fifth fastest runner on the team. With consistent training, Eddie improved, eventually becoming the fastest runner on the team of nine. As the 2018 season started, Eddie says he not only wanted the team to qualify for the state competition but also wanted to earn all-state honors, which recognizes the top 25 runners in the state meet. Not only did he accomplish that goal, Eddie ran a personal best – 14 minutes and 38 seconds. At first, Jack Martin didn’t know if running was for him. He thought of quitting shortly after he joined his middle school’s cross country team in sixth grade. But Jack stuck with it and over time saw improvement. Jack says he enjoys running because of the friends he has made and the competitive aspect of the sport. With running, he is always striving to improve. At the state meet, which he describes as “the loudest meet I’ve ever been to,” Jack achieved his personal best running time – 15 minutes and 39 seconds. Running literally runs in CJ Miller’s family. And so he worked harder from the moment he joined the Rolling Meadows team. CJ’s focus on training and teamwork has helped him to achieve personal records every year and become a leader. The 17-year-old, who is interested in studying math or statistics, says he plans to continue running in college. After high school graduation, he will continue to run with the Rolling Meadows team during summer training because he feels it is important. Members of the Rolling Meadows boys cross country team run during a meet leading to the state competition. Nate Orlyk believes determination and persistence helped the Rolling Meadows cross country team overcome obstacles and earn a spot at the state meet. The 17-year-old plans to study chemistry in college and run on a club team. He hopes the team’s work ethic carries on after he and his peers graduate in May. 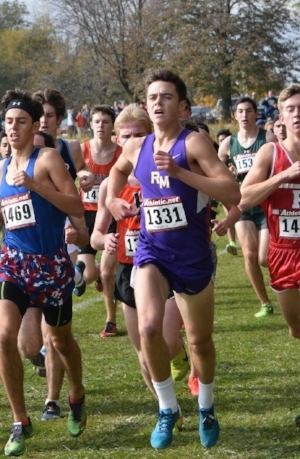 In his eighth grade yearbook, Royce Piscitello wrote that his goal was to run at state with the Rolling Meadows High School cross country team. Royce, who competed in his first 5K in third grade and ran throughout junior high, recalls sharing that goal with his teammates during their freshman year. Together, he and four of the top runners in their grade – a group they called ‘The Fab 5’ – made big plans for the team. So when the team did not perform as they had hoped last year, Royce and other members of the varsity team decided to get serious about running in order to qualify for state – and followed through with expectations. Royce, 17, plans to study supply chain management in college and continue running. He is proud that he and his teammates did not give up on their dream and pushed through obstacles. Though he’d start the year as one of the team’s faster runners, he says he tended to drift away from the top spots as the season finished. This year, he focused on trust, being consistent and putting in the extra effort, and found himself as one of the team’s top three runners throughout the season. Influenced by his older brother, Matt tried out for the cross country team when he was in sixth grade. He enjoyed running and the friends he made from the team, so sticking with the sport in high school was an easy decision.